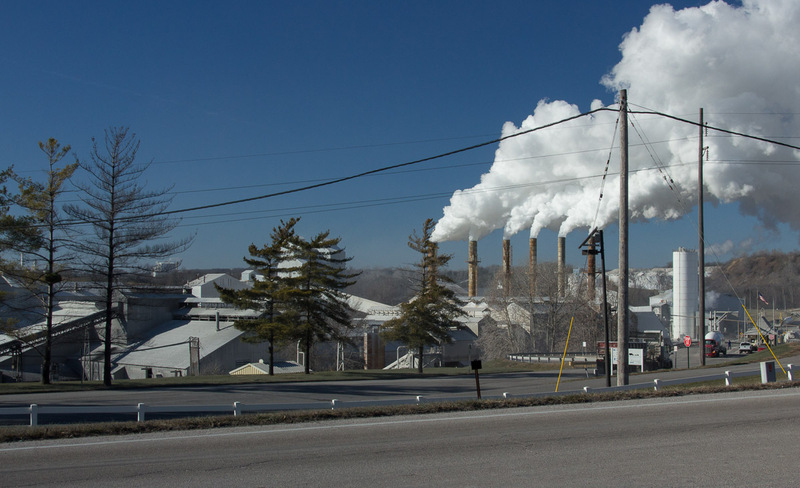 In the previous post, I summarized information about the 10 GHG emitting facilities in Missouri. In this post, I will count them down and profile them. When possible, for each facility I will give the date the plant entered service, the amount of GHG emitted, some of the economic benefit derived from the plant’s products, and closing plans that have been announced by the plant’s owner. 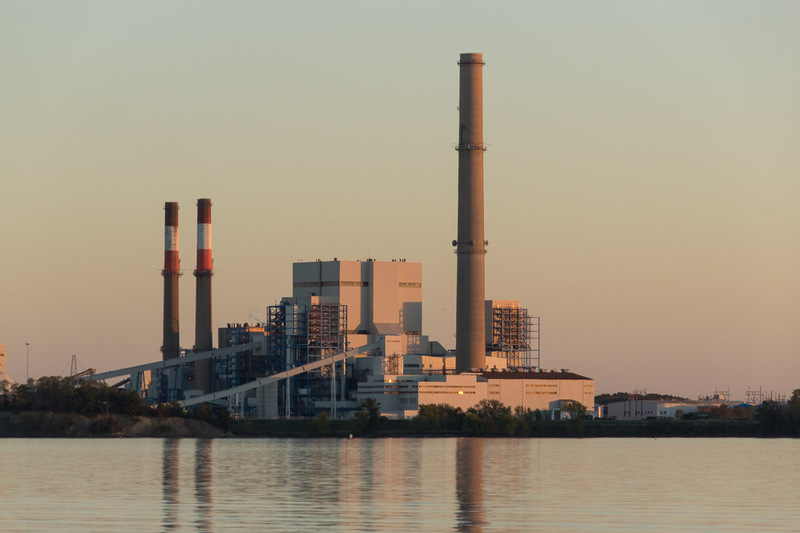 Typically, closing plans for industrial facilities are not publicly discussed, but they are required by Integrated Resource Plans that public electric utilities must file. They often extend a decade or two into the future and have been formulated partially in response to EPA clean air regulations. Thus, as economic and regulatory environments change, and as technological alternatives become more or less feasible, I would expect closure plans to change with them. 10. Meramec Energy Center. GHG emissions 2015: 2,324,558 MTCO2e. Figure 1. The Meramec Engergy Center. Photo by John May. The Meramec Energy Center is located in southeastern St. Louis County, at the confluence of the Meramec and Mississippi Rivers. It is a coal-burning electricity generating station with a nameplate capacity of 831 MW. In 2009, it generated 5,362,000 MWh (data from CARMA, www.carma.com). If the average home in the United States consumes 10.8 MWh per year (Energy Information Administration), then the Meramec Plant produces enough electricity to power 496,481 homes. 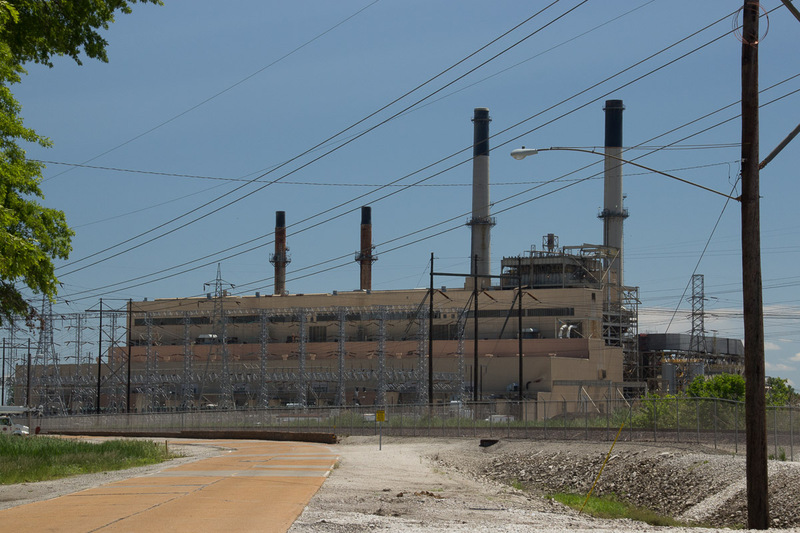 It is owned by Union Electric Co., a subsidiary of Ameren Missouri. 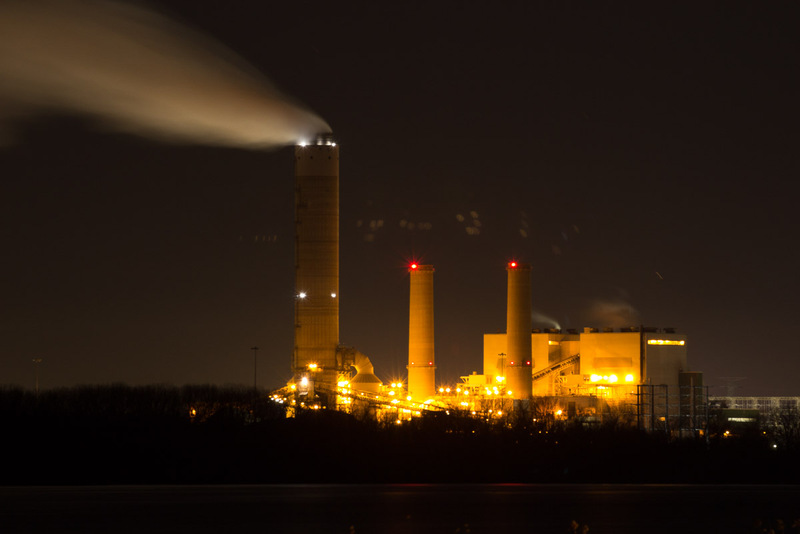 It began operation in 1953, and according to an article 7/12/2014 in the St. Louis Post-Dispatch, Ameren announced plans to close the Meramec Energy Center in 2022. If emissions remain at the current level, by then it will have emitted an additional 13,947,348 MTCO2e into the atmosphere. In 2015, the Meramec Energy Center emitted 2,324,558 million MTCO2e (EPA Facility Level Information on Greenhouse Gases Tool). Figure 2. The Mississippi Lime Co. Ste. Genevieve Plant. Photo by John May. The Mississippi Lime Company is located just west of the city boundary of the City of Ste. Genevieve. It produces a variety of calcium products that are related to cement, but not equivalent, such as quicklime and hydrated lime. The output of this plant is unknown. It is a privately held company with headquarters in St. Louis. Specific information about the plant is in short supply, but the history of the company on the company’s website indicates that the site was purchased and the kilns constructed during the 1920s. Future plans for the plant are unknown. quarried limestone is crushed, and then heated at about 825°C in a kiln. Fossil fuel, most often coal, is burned to heat the kiln, releasing carbon dioxide. In addition, in the kiln, the limestone undergoes a chemical change that converts it to quicklime. This reaction releases carbon dioxide. 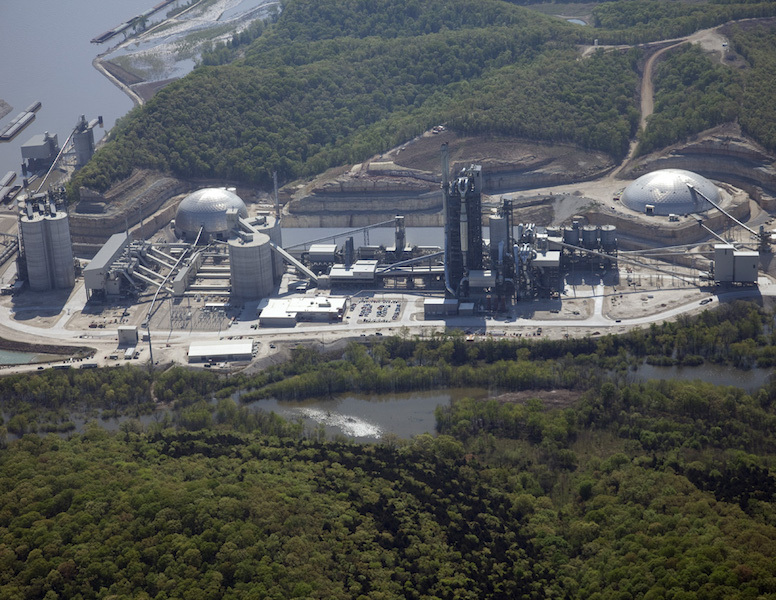 The Mississippi Lime plant released 2,430,415 MTCO2e in 2015. A footnote on the EPA website says that some of the CO2 emitted by the plant is captured and reused, not released into the atmosphere, but the amount is not specified. 8. Holcim Ste. Genevieve Plant. GHG emissions 2015: 2,598,048 MTCO2e. Figure 3. The Holcim Ste. Genevieve Plant. Source: Thanks to Holcim (US) Inc. for supplying this photo, as I was unable to take one myself. The Holcim Ste. Genevieve Plant is located on the Mississippi River at the northeastern corner of Ste. Geneieve County. Though across the county line, it is physically adjacent to the Rush Island Energy Center (see below). It is a cement manufacturing plant, and claims to have the largest single kiln line in the world. It is claimed to have the capacity to produce 4 million metric tons of cement per year. The U.S. Geological Survey estimates that the Interstate Highway System contains 48 million metric tons of cement, so the Ste. Genevieve Plant turns out about 1/12th of that amount each year (USGS 2006). The plant is owned by Holcim US, a subsidiary of Holcim Ltd. of Switzerland. The plant entered service in 2010, and future plans for the plant are not known. The Ste. Genevieve Plant received the EPA Energy Star Award for energy efficiency in each year from 2010-2015. It has also received Gold Certification from the Wildlife Habitat Council for its wildlife conservation efforts. Greenhouse gases are emitted in 2 ways during cement production. Cement is produced by quarrying limestone, crushing it, and then heating it at about 1,500°C in a kiln. Fossil fuel, most often coal, is burned to heat the kiln, releasing carbon dioxide. In addition, in the kiln, the limestone undergoes a chemical change that converts it to cement. This reaction releases carbon dioxide. The Holcim Ste. Genevieve Plant emitted 2,598,048 MTCO2e in 2015. Figure 4. The Hawthorn Plant. Photo by John May. The Hawthorn Plant is located along the banks of the Missouri River in northeastern Kansas City. It is a coal-burning electricity generating station with a nameplate capacity of 565 MW. In 2009, it generated 4,174,900 MWh (data from CARMA, www.carma.com). If the average home in the United States consumes 10.8 MWh per year (Energy Information Administration), then the Hawthorn Plant produces enough electricity to power 386,565 homes. It is owned by Kansas City Power and Light, a subsidiary of Great Plains Energy. In the photo, to the right of the main structure stand several small boxy structures. Those are natural gas peaking generators. Though they still emit GHGs, they are cleaner than the coal-burning main plant. In addition, they can be started when electricity demand is peaking and turned off when it is slackening, compared to the coal-burning main plant, which cannot. In 2015, the Hawthorn Plant emitted 3,145,642 million MTCO2e (EPA Facility Level Information on Greenhouse Gases Tool). 6. Sioux Energy Center. GHG emissions 2015: 4,314,760 MTCO2e. Figure 5. The Sioux Energy Center. Photo by John May. The Sioux Energy Center is located in northern St. Charles County, along the banks of the Mississippi River. It is a coal-burning electricity generating station with a nameplate capacity of 970 MW. In 2009, it generated 5,760,500 MWh (data from CARMA, www.carma.com). If the average home in the United States consumes 10.8 MWh per year (Energy Information Administration), then the Sioux Plant produces enough electricity to power 533,379 homes. It is owned by Union Electric Co., a subsidiary of Ameren Missouri. It began operation in 1967, and Ameren filed a plan indicating it would be closed no later than 2033. If emissions remain at the current level, by then it will have emitted an additional 73.4 million MTCO2e. In 2015, the Sioux Energy Center emitted 4,314,760 million MTCO2e (EPA Facility Level Information on Greenhouse Gases Tool). 5. New Madrid Power Station. GHG emissions 2015: 5,815,694 MTCO2e. Figure 6. The New Madrid Power Station. Photo by John May. The New Madrid Power Station is located along the banks of the Mississippi River six miles southwest of New Madrid, Mo. It is a coal-burning electricity generating station with a nameplate capacity of 1,200 MW. In 2009 it generated 7,246,800 MWh of electricity. If the average home in the United States consumes 10.8 MWh per year (Energy Information Administration), then the New Madrid Plant produces enough electricity to power 671,000 homes. It is owned by the Associated Electric Cooperative. AEC provides electricity to 51 local electricity cooperatives throughout Missouri and in parts of Oklahoma, and Iowa. It’s two units entered service in 1972 and 1977. Regarding future plans for the station: in reply to a request for information, the company stated that it had no plans to close or convert the fuel source for the plant (Viquet 2016). In 2015, the New Madrid Power Station emitted 5,815,694 million MTCO2e (EPA Facility Level Information on Greenhouse Gases Tool). 4. Rush Island Energy Center. GHG emissions 2015: 6,833,938 MTCO2e. Figure 7. The Rush Island Energy Center. Photo by John May. The Rush Island Energy Center is located at the southeastern corner of Jefferson County along the banks of the Mississippi River, adjacent to the Holcim St. Genevieve plant (see above). It is a coal-burning electricity generating station with a nameplate capacity of 1,180 MW. In 2009, it generated 8,017,200 MWh (data from CARMA, www.carma.com). If the average home in the United States consumes 10.8 MWh per year (Energy Information Administration), then the Sioux Plant produces enough electricity to power 742,333 homes. It is owned by Union Electric Co., a subsidiary of Ameren Missouri. It began operation in 1976, and Ameren’s 2014 Integrated Resource Plan stated that the company had “developed assumptions for an evaluation of retirements of Labadie and Rush Island Energy Centers.” (Ameren Missouri 2016) I don’t understand this statement to indicate that Ameren is considering closing the facility, only that they have developed a set of assumptions that will be used in an ongoing fashion to monitor its viability. In 2015, the Rush Island Energy Center emitted 6,833,938 million MTCO2e (EPA Facility Level Information on Greenhouse Gases Tool). 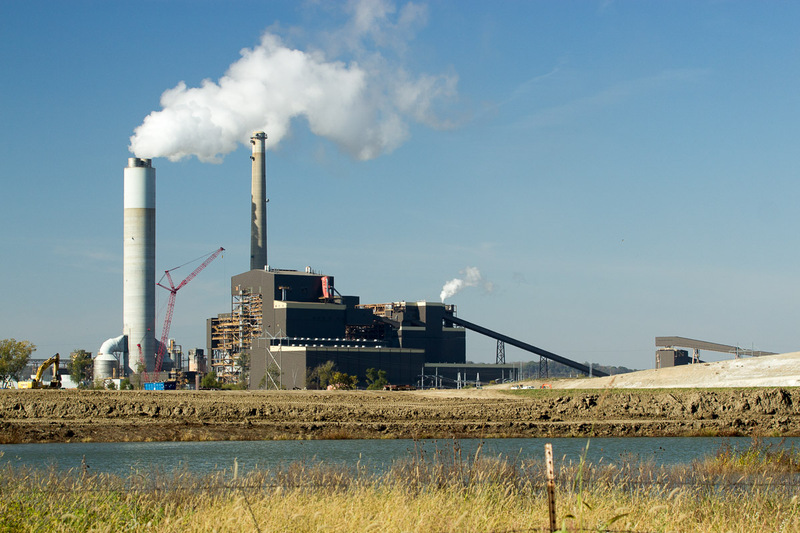 Note: On 1/23/17 the U.S. District Court for Eastern Missouri found the Rush Island Energy Center in violation of the Clean Air Act because Ameren Missouri had performed major modifications to the facility without installing required pollution control equipment. Ameren had tried avoid its obligation by characterizing the work as routine maintenance. Figure 8. The Thomas Hill Energy Center. Photo by John May. The Thomas Hill Energy Center is located on the banks of the Thomas Hill Reservoir, about 12 miles northwest of Moberly. It is a coal-burning electricity generating station with a nameplate capacity of 1,135 MW. In 2009 it generated 7,379,800 MWh of electricity. If the average home in the United States consumes 10.8 MWh per year (Energy Information Administration), then the Thomas Hill Energy Center produces enough electricity to power 683,315 homes. It is owned by the Associated Electric Cooperative. AEC provides electricity to 51 local electricity cooperatives throughout Missouri and in parts of Okalahoma, and Iowa. 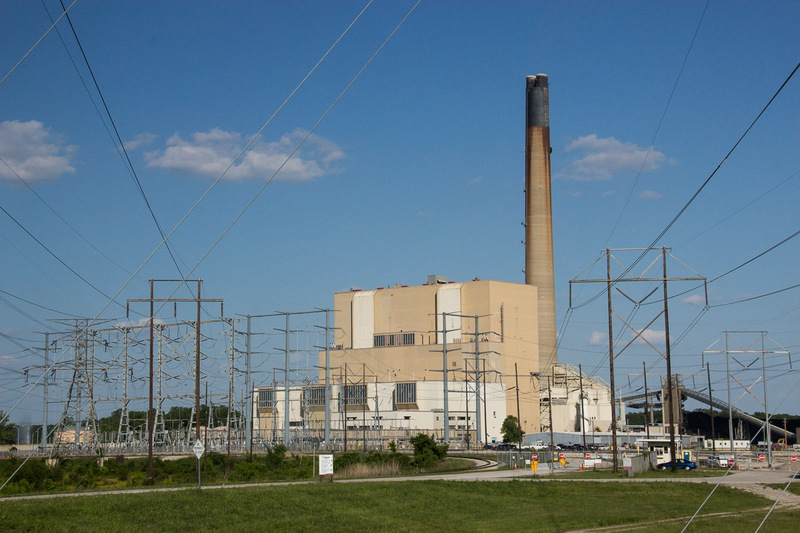 Thomas Hill’s three generating units entered service in 1966, 1969, and 1982. Regarding future plans for the station: in reply to a request for information, the company stated that it had no plans to close or convert the fuel source for the plant (Viquet 2016). In 2015, the Thomas Hill Energy Center emitted 7,506,076 million MTCO2e (EPA Facility Level Information on Greenhouse Gases Tool). 2. Iatan Generating Station. GHG emissions 2015: 8,911,498 MTCO2e. Figure 9. The Iatan Generating Station. Photo by John May. The Iatan Generating Station is located in northwestern Platte County, along the banks of the Missouri River, between Kansas City and St. Joseph. It is a coal-burning electricity generating station with a nameplate capacity of 1,576 MW. 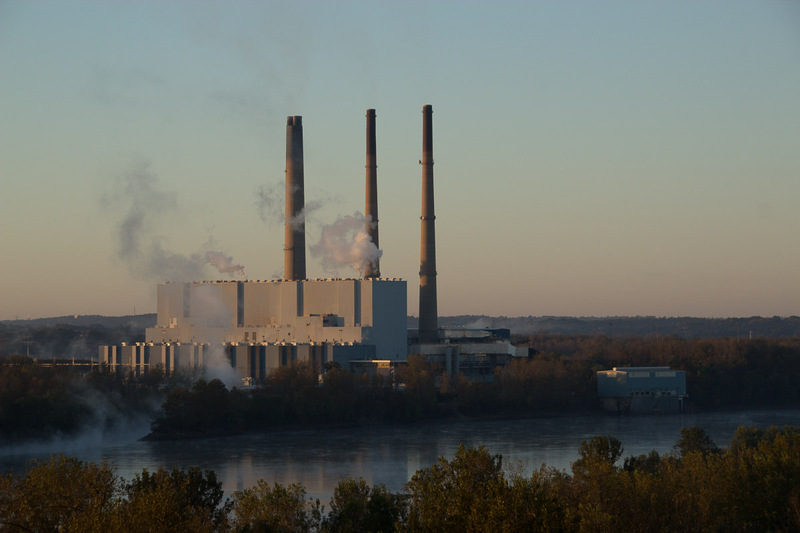 It is the second largest generating station in Missouri, and the state’s second largest GHG emitter. The second unit at Iatan entered service after 2010, so generating statistics for 2009 are irrelevant. It is owned by Kansas City Power and Light, a subsidiary of Great Plains Energy. Iatan’s 2 generating units entered service in 1980 and 2010. Regarding future plans for the station, in reply to a request for information, the company referred me to their website, where I could find none. Given that the second unit was completed only 6 years ago, I would expect the company plans to continue to operate the plant for the foreseeable future. In 2015, the Iatan Generating Station emitted 8,911,498 million MTCO2e (EPA Facility Level Information on Greenhouse Gases Tool). 1. Labadie Energy Center. GHG emissions 2015: 14,754,371 MTCO2e. Figure 10. The Labadie Energy Center. Photo by John May. The Labadie Energy Center is located in Franklin County along the banks of the Missouri River east of Washington. 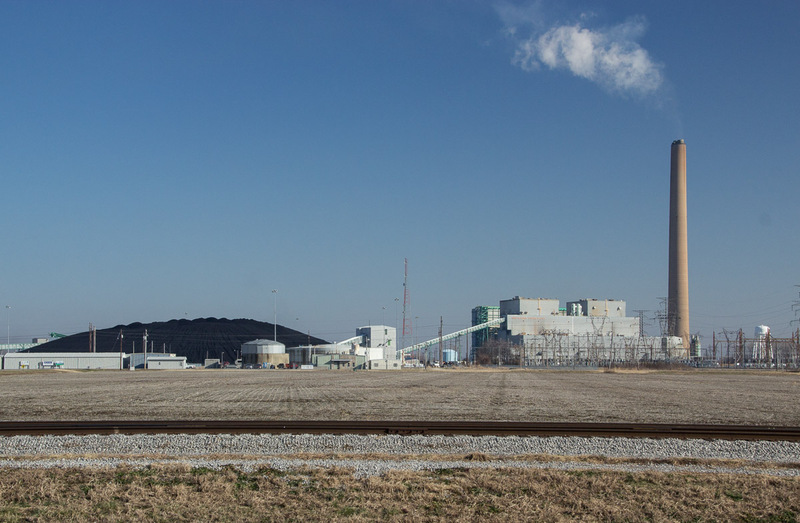 It is Missouri’s largest coal-burning electricity generating station, with a nameplate capacity of 2,372 MW, about half-again as large as the Iatan Station. In 2009, it generated 17,238,000 MWh (data from CARMA, www.carma.com). If the average home in the United States consumes 10.8 MWh per year (Energy Information Administration), then the Labadie Energy Center produced enough electricity to power 1,596,111 homes. It is owned by Union Electric Co., a subsidiary of Ameren. In 2015, the Labadie Energy Center emitted 14,754,371 million MTCO2e (EPA Facility Level Information on Greenhouse Gases Tool). As you have read this post, you probably noticed that some of the photos showed billowing white clouds gushing out of a chimney, some showed a thin plume, and some showed no plume at all. I think the differences make for an interesting discussion, and they will be the focus of the next post. Ameren Missouri. 2016. Integrated Resource Plan. Viewed online 12/10/2016 at https://www.ameren.com/missouri/environment/renewables/ameren-missouri-irp. Energy Information Administration. Frequently Asked Questions: How much electricity does an American home use? Accessed 10/20/2016 at https://www.eia.gov/tools/faqs/faq.cfm?id=97&t=3. EPA. Facility Level Information on Greenhouse Gases Tool. http://ghgdata.epa.gov/ghgp/main.do. Data downloaded 10/20/2016. EPA. 2015. EPA Fact Sheet: Social Cost of Carbon. Downloaded 12/10/2016 from https://www3.epa.gov/climatechange/Downloads/EPAactivities/social-cost-carbon.pdf. EPA. 2015. 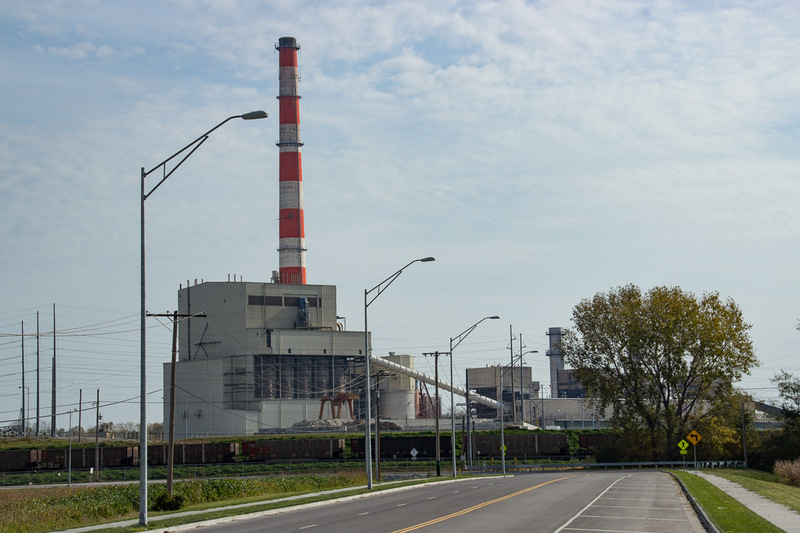 Facility Profile Report: Ameren Missouri Labadie Energy Center. Retrieved online 12/10/2016 at https://iaspub.epa.gov/triexplorer/release_fac_profile?TRI=63055LBDPWNO10L&year=2011&trilib=TRIQ1&FLD=&FLD=RELLBY&FLD=TSFDSP&OFFDISPD=&OTHDISPD=&ONDISPD=&OTHOFFD=. Genova, Marcus, Area Environmental and Public Affairs Manager, Holcim (US) Inc. Email message to John May 1/10/2017. United States v. Ameren Missouri. Case 4:11-cv-00077-RWS, U.S. District Court for Eastern District of Missouri. Viewed online 1/25/2017 at http://www.moed.uscourts.gov/sites/default/files/Ameren%20Memorandum%20and%20Order.pdf. U.S. Census Bureau. Quick Facts: Missouri. Viewed online 12/10/2016 at http://www.census.gov/quickfacts/table/PST045215/29. U.S. Geological Survey. 2006. Materials in Use in the U.S. Interstate Highways. Viewed online 12/10/2016 at https://pubs.usgs.gov/fs/2006/3127/2006-3127.pdf. Viquet, Mark, email message to author, 12/12/2016. By mogreenstats in Climate Change, Greenhouse Gas Emissions on 2017/01/26 .